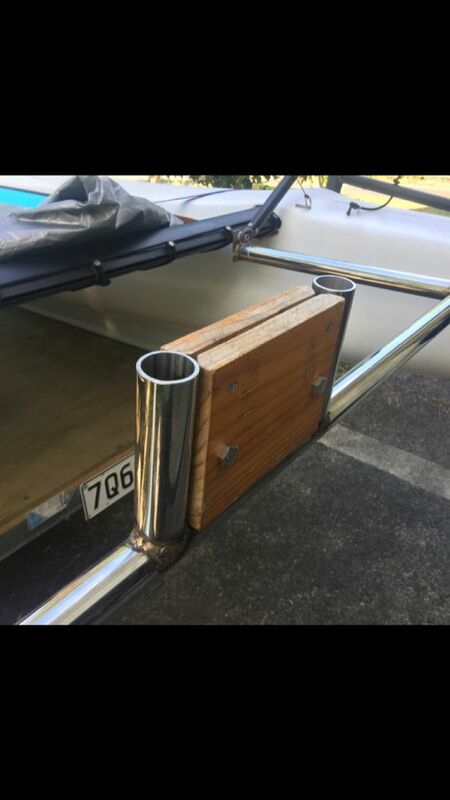 I could never get my head around drilling more holes in the rear crossbar or in the hulls, so I had a good think about another way to do it. 2mmx40mm SS flat bar drilled to match existing rudder mount holes. MAKE SURE YOU PUT SCREWS BACK IN WITH LOCTITE! I left 2mm gaps between deck slats to allow straps to go through - useful for tying down extra fuel tanks and coolers. 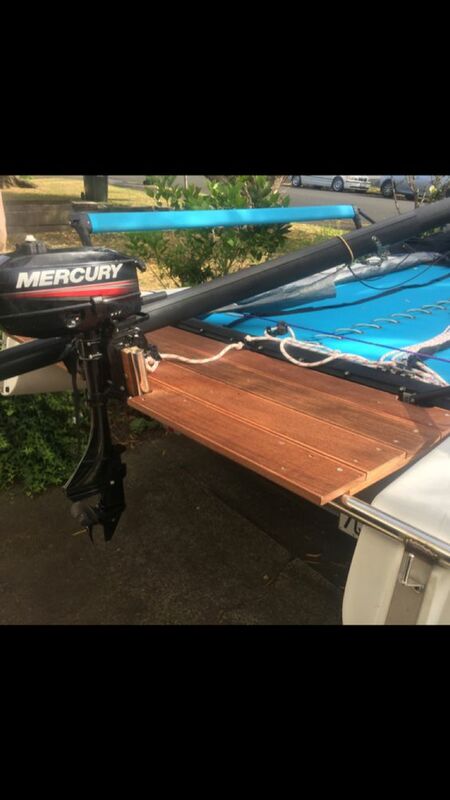 As long as these items are tied down at the back of the deck they shouldn't interfere with the tiller bar. 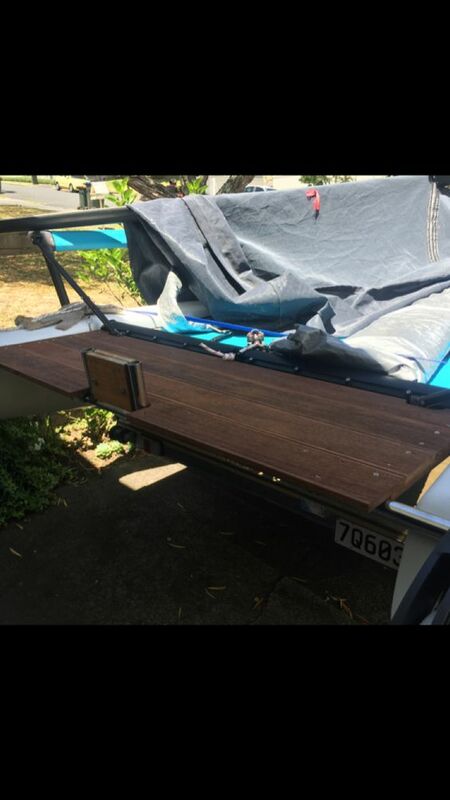 I have used the boat with this mount prior to adding the deck. Under power it works very well. 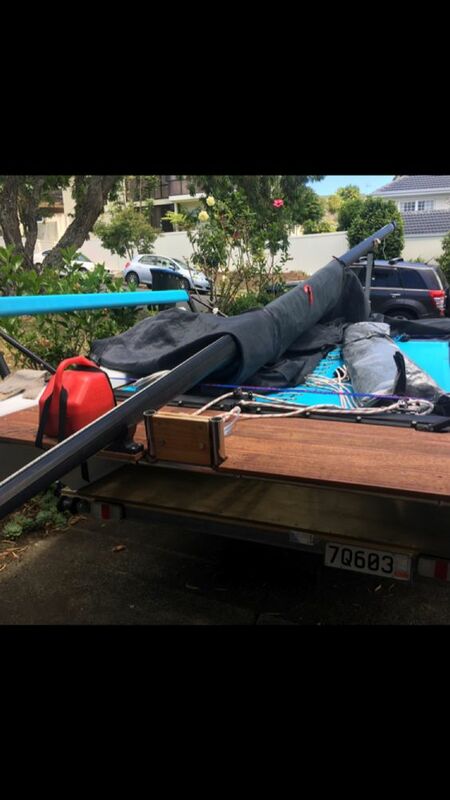 Under sail, with the motor raised, in flat water it is perfect, but you have to play with your position in the boat a bit when it gets very choppy to stop the mount and rear bar catching the water and spraying the motor (only a little bit). I think the deck should keep the motor drier. Last edited by Nolipoli on Sat Dec 30, 2017 11:52 am, edited 1 time in total. Great idea Robert on the new design. I did not need mine to tilt up any further as my honda tilts up plenty to clear the water. Also, I think you were able to shorten your support arm only because of your motor head being much smaller so it doesn't interfere with the tiller. 1) Looks like you were able to shorten the distance while still maintaining clearance for the rudder bar, is that true? What is the new distance? 2)Where did you source the 1"x1" (I am guessing on size) bar and complementing bars? 80/20 as well? On a different design....How would a motor mount work if it was just based upon the rear crossbar installed by wanderoo? Seems like it could support the weight no problem but you would have to prevent rotation somehow. That would prevent having to drill the main trampoline support. Thanks for the new design. CHECK OUT THE LINK TO THE ADDITIONAL PHOTOS OF THE MODIFIED VERSION BELOW. 1) Yes, I was very focused on making the arm as short as possible to minimize stress on the cross bar. I actually developed the new design using SketchUp so I could simulate the distance of the tiller cross bar when the rudders are fully turned (i.e. when the bar is most aft)... this way I could get the lengths perfected. As Keith later points out, this distance is different for every motor since it is the head of the motor that is most likely to bang into the tiller cross bar. You'll want to check it with the motor in the up and down position. I will try to post a link below to JPEGs of the 3-D images (yes, I'm a geek). 2) Yes, I got all the aluminum parts from 80/20 -- it's all stock stuff. I did have to drill the pieces for the supports for the hing. There are flat washers between those pieces and the main 1x1 to keep it from rubbing and let it rotate up and down freely. You can see how I use same pin to secure it to lock it up or down. 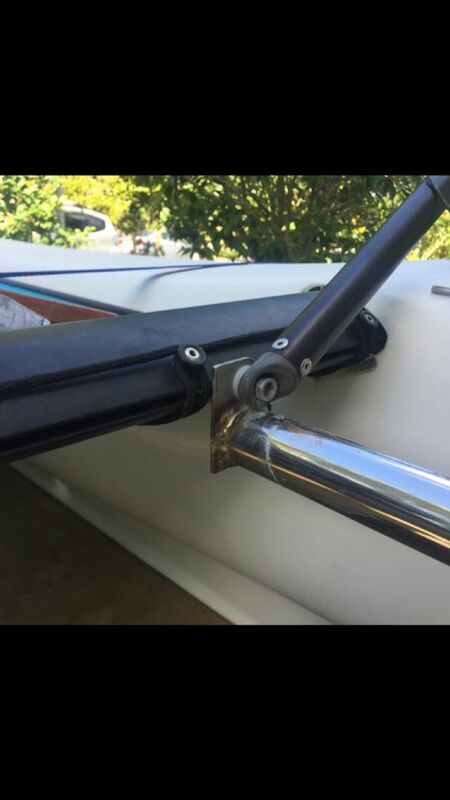 Note that the retaining latch that goes under main extension bar serves two purposes: retain the pin of course, but it also keeps the arm from rotating higher (yes, higher... in the event you flip the boat! which I've done -- keeps the motor from banging back into the tramp or hanging down in the water). 3) I just use brawn to raise and lower. I'm mid-40's and still able to muscle it up, but my wife and kids can't do it. I thought of a lanyard with a little pulley to give mechanical advantage could work... remember that in my setup, i have just the Torqeedo motor mounted... I keep the battery and tiller on the boat... this means only 20 lbs are on the mount. A gas motor would be harder to lift... I would 1) put in the pully and 2) put another plate below the movable arm part to prevent it from falling down into the water. since there are holes on all sides, you could just bolt this "stop plate" in place. 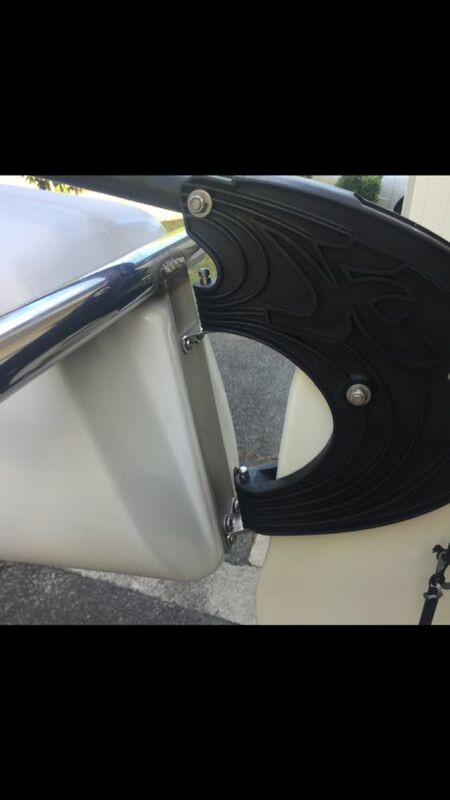 4) I used all 316 grade stainless steel hardware from Bolt Depot... even the washers... i sail in salt water so it's a must. It was all 5/16 and I used nylon locking washers. I also used 3 Elevator Bolts (not 316 unfortunately) to bolt the wood onto the aluminum L brackets (2 inches each)... I wanted some surface area to compress against the wood (in hind sight - large washers recessed would have been just fine, but it looks nicer it its in the budget). The other odd and expensive part was the 316 grade eye bolt with shoulder (part 18517)... it was $18 but what the heck... 1 and 1/8 long but should have gotten shorter... you can see what I did to solve for this, I have an upside down nylon nut against a washer at the perfect height to allow the retaining nut below to fully tighten, but also prevent the shaft of the eye bolt from going too far down and hitting the existing metal rope retention loop for the mainsail traveler that is riveted to the cross bar (see the detailed photos). Finally, I was really nervous about drilling the cross bar. But I got the nerve and did it, and it worked out great. Really happy with the design and looking forward to season 2 with the setup - it's snowing here in VA on April 7! Here is the link to more pictures... hopefully this works!?! One other thing I forgot to add: when you look at the photos, you will see I used two of the standard triangular plates from 80/20 that sandwich to the boat. this is a very rigid setup as those two plates are clamped together using two through bolts that go through the main extension shaft and 4 spacer plates (these also are stock parts from 80/20 with two pre-drilled holes). Look at the photos. You bolt all this together first. 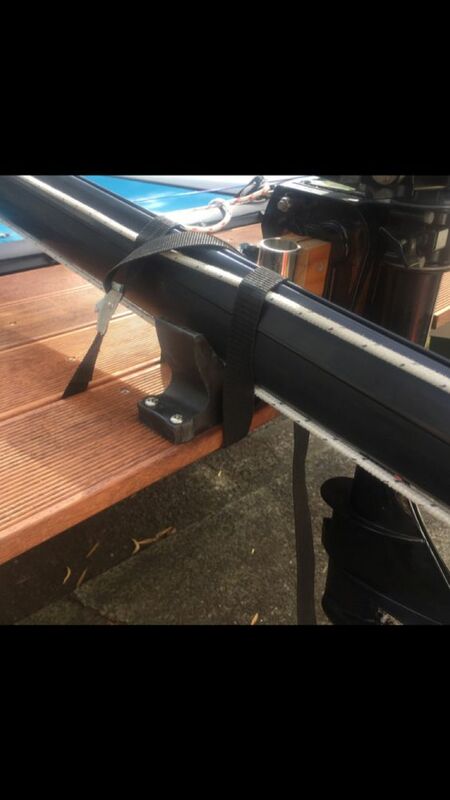 Then I put this in place using levels and "eyeballing" it get the right angle off the back of the boat so the shaft is not angled too high or low (mine slopes slightly down to the water when in the down mode) and is at a right angle to the rear cross bar... I used a large rafter square to get it right and then marked the bar where to drill. You know, measure 3 times, drill once kind of thing. The fact that the top and bottom plates are one rigid unit I think is another advantage of this setup. I put minimal pressure on the cross bar-- I didn't need to compress these two peices together much as they are already connected with those two other through bolts (I did crank down on those). Finally: Since i took those photos, I moved all of the spacer plates to BELOW the main extension shaft... this raised the shaft an inch or two upwards as my motor mount was fairly close to the water when down -- especially if the boat is loaded -- the nice part is that you have this to play around with if you need to tweak it when done. Has anybody seen this pipe based motor mount design before, see at position 1.57. Who makes it? How does it attach to the rear? Hi Keith, thanks very much for the design idea and all the details and pics. I am in OZ, so a bit harder to get the parts as they all have to be custom coated. 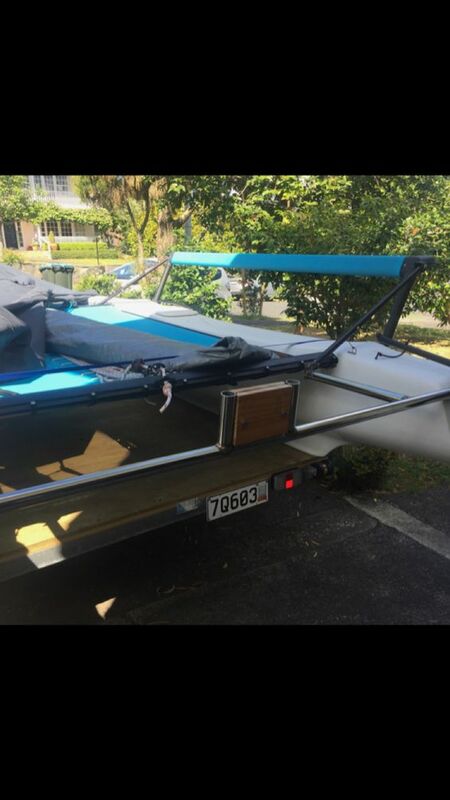 Looking forward to getting a motor on the Getaway as It'll sure beat paddling! I am tempted to put a stainless beam across the back to support the back of the bracket similar to another post. Did you have any thoughts on this? I finally got around to making one in qustralia. I did add the stainless bar to reduce twist and flex. Works well for me. Thanks again Keith. I LOVE your design and copying it almost exactly. Thank you for sharing. Really excited and the “swim desk” look to it is amazing. Two thumbs up. One question, what are the measurements of your motor mount square/rectangle portion? Putting on a suzuki 2.5. ... or do others have some guidelines? I’d hate to weld it up and not have the motor fit on there properly! Oh, and the V-block, where’d ya get that! ?